Educators, especially those who blog, throw the term, “community,” around a lot. While it is of course possible to create, sustain and build thriving communities online, I got a taste of the old-fashioned variety at our local movie googleplex during a showing of The Simpsons Movie. When Homer Simpson walks his pig, Plopper, upside down on the ceiling and begins to sing the hauntingly addictive “Spider Pig” theme, the majority of people – kids and adults – in the theatre began to sing along spontaneously. Yes, it was a 15-second long impromptu community choir right there at The Simpsons Movie! It’s worth noting that film trailer does not feature the entire (albeit brief) song. The audience either read/heard it online, guessed or enough people saw the film already. The other extraordinary example of community in the credits of The Simpsons Movie. The credits revaled the hundreds, if not thousands of artists, writers, technicians and actors who made the film. For those of you wondering… Yes, there is a Wikpedia entry for “Spider Pig!” That is where I leanred that the pig’s name was Plopper. (I wasn’t taking notes during the film.) It’s on the page detailing the countless animal characters (it’s own Wikipedia entry) featured on The Simpsons. YouTube also has the entire Spider Pig sequence from the Simpsons Movie, but this must be a copyright violation. Below is a clip from the film trailer, also found on YouTube. In David Warlick’s blog post, It’s Going to Happen Without Them, Mssr. Warlick makes a wide-eyed prediction that the Creative Commons (CC) is going to put the textbook industry out of business. Unless they do what? Should the for-profit textbook industry begin to give away their products (and profits). Now that’s a formula for corporate success! My take is that if the Textbook industry does not work really fast to reinvent itself in the image of a more participatory, reader directed, and people connecting information environment, then it’s going to happen without them. OK, let’s say I agree that learning should be more participatory, learner-centered and collaborative. What does that ideal have to do with the Creative Commons? The Creative Commons isn’t about making all content free. The purpose of the Creative Commons is to provide creators with more control over the copyright and subsequent use of their creative output. “Creative Commons provides free tools that let authors, scientists, artists, and educators easily mark their creative work with the freedoms they want it to carry. You can use CC to change your copyright terms from "All Rights Reserved" to "Some Rights Reserved." We must stop wrongly conflating the open-source movement with free. They are not the same thing. I believe that the purpose of Warlick’s post was to pass along news of the Creative Commons’ new project, ccLearn, the education division of the Creative Commons. Right away I have problems with underlying assumption of this project. Such initiatives are based on the flawed premise that education equals access to content (information). Once again, this falls prey to what I call the information fallacy. Knowledge is constructed as a result of experience. Access to information represents, but a small piece of the learning process. Besides, how does a teacher reconcile a desire to make all content free and accessible with schools’ ongoing obsession with plagiarism and cheating? I’m OK since I haven’t given a test or quiz since 1990, but what about the sheep-like teachers for whom textbooks are created? There are three deeply flawed assumptions underlying the notion that the latest CC scheme and its competitors, such as Curriki, will reform education. 1) No amount of groovy new wave talk of mashing-up or remixing of content can disguise that this is yet another form of tabula rasa education wrapped in a web page. This latest initiative Creative Commons initiative is about access to arbitrary educational content. This is a fancy way of saying delivery of information to students. 2) Just because a space is created for the sharing of educational “materials,” it is unlikely that many teachers will actually do so. After all, teachers do not share lesson plans. They may share ideas, but ideas are hardly what we mean by “educational materials.” Look at any of these “sharing” sites and you’ll find lesson plans, PowerPoint presentations and worksheets. Great teachers are not dependent on such static artifacts created for other students and weak teachers are unlikely to improve if their job is reduced to finding pre-chewed materials. I suspect that the same sorts of teacher who think their worksheets are better than everyone else’s will publish “digital resources” for other teachers. A few will make a bit of money, but these materials will have zero impact on the daily practice of most teachers and even less positive influence over the education their students enjoy. This fantasy is hardly new or dependent on Web 2.0. Your local bookstore offers countless workbooks and backline masters for sale. Do we want to extend this tradition to the powerful medium of the Web? Look at Curriki and see the profoundly dull, random and mediocre materials being touted as a way to revolutionize learning. Can you tell that a billionaire finances Curriki? Who owns the content? Why would educators wish to write textbooks when there is so little to gain and when primary sources abound, both on the web and in convenient book form? Many of these sites look like a garage sale of content far beneath the exacting standards of even Frank Schaffer. Textbooks are a technology that has had an enormously deleterious affect on learning. They are filled with homogenized factoids, written by anonymous committees possessing dubious qualifications and are designed to enforce a uniform teaching experience regardless of individual student differences. Textbooks are by definition one-size-fits-all approaches to teaching in which learning is at best an accidental side effect. I’ve seen countless cases where a school district has gone to extraordinary lengths in order to fund new textbook purchases. In one case, science teachers were fired so the district could afford new science textbooks. Politicians get elected promising new textbooks and under-funded schools beg for textbook money. This is the golden age of (real) publishing. I like to take teachers to the local bookstore and demonstrate that there are better trade paperbacks on any subject at every conceivable developmental level than a textbook. Yet, states spend billion on such backpack ballast and add insult to injury by requiring that the books not be updated for five, or in some cases, ten years. 3) It is fantastically naïve to suggest that teachers sharing worksheets online endangers the textbook industry in any way. They are a multi-billion dollar industry most Americans (and certainly politicians) equate with education. They’re as American as spelling tests and handwriting instruction. The textbook industry is not going to roll over and play dead just because some teachers are blogging. The keys to success in textbook publishing are simplicity, uniformity and compliance. Textbooks are about control (real or imagined) of the public school system. The companies make it very easy for school districts to buy and rollout new textbooks like clockwork. Nobody buys a textbook because it’s good. They do it because it’s quick, easy and asks nothing of teachers while promoting a public image of progress. Recent trends like the Open Court Coaches (snitches) employed in Los Angeles and other districts; along with scripted curricula like “Success for All” demonstrate the destructive power textbooks hold over classroom instruction. These models also demonstrate how willing decision-makers are to enforce compliance and homogeneity on their teachers. In too many cases, textbooks are weapons used against learners. It hardly matters if the weapon pointed at children is created by teachers for free on the web or by multinational conglomerates adroit at separating taxpayers from their treasure. Textbook companies are incredibly nimble. Emphasize authentic literature and the next textbook series will have literature included. The problem is that the 32 page Sarah Plain and Tall will be abridged and each paragraph will be followed by a multiple-choice comprehension question that destroys the narrative and distracts the reader. The Zelig-like shape-changing ability of the textbook industry has found a way to wreck every new technology that may render it obsolete. Now students can be bored with incomplete misinformation not only by reading a hardcover text, but on their iPod and laptop as well. Yippee! Throw a new technology at textbook publishers and they’ll turn it into a textbook. Underestimate the power of the textbook industry at your peril. Where do large district superintendents work after they retire? Textbook companies. Why? They are hired for their rolodex and access to other superintendents (re: customers) Visit Austin, Texas and see the textbook publishing offices walking distance from the state capital. Coincidence? Hardly! Three foreign conglomerates control the vast majority of American textbooks. Why isn’t Tom Friedman or the Congress upset about turning our educational system over to foreigners? These same companies control standardized testing and test-prep. Their dominance is formidable and likely to be with us for a very long time. Textbooks even play a role in our history. Lee Harvey Oswald shot President Kennedy from the Texas School Book Depository, not the Creative Commons. Lawrence Lessig can afford the luxury of eating his own dog food by giving his books away. He’s a world-class attorney and tenured academic at Stanford. Is David Warlick giving his most recent book, Classroom Blogging: A Teacher’s Guide to the Blogosphere, away for free? 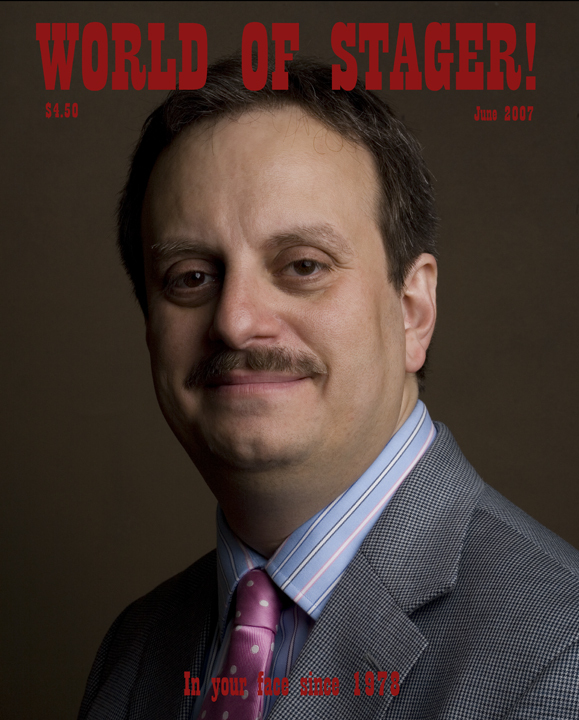 A review by Gary S. Stager, Ph.D. I have long been uncomfortable with how eager school leaders are to embrace popular business books. It seems odd that educators would seek inspiration from business authors rather than other educators. When I attended a conference where five consecutive speakers quoted from Tom Friedman’s book, The World is Flat, I was inspired to write the controversial article, Reading Fads: Why Tom Friedman Does Not Compute. That article not only discussed the bizarre conclusions and sloppy logic presented by Tom Friedman, but also explored why school leaders are so drawn to business self-help books. Surely there are lessons to be learned from actual educators who can inspire educational practice. As more and more educators discuss their craft in the blogosphere a remarkable number of them quote from business how-to manuals while very few ever mention the work of notable educational theorists and practitioners. The concise nature of the blogosphere takes already oversimplified principles and abridges them to fit the grammar of the medium. Inspired by members of the online community I read the dreadful Everything is Miscellaneous and observed countless discussions of The World is Flat, A Whole New Mind, HOW We Do Anything Means Everything…in Business (and in Life), Wikinomics and Informal Learning. Not wanting to be left out, I rushed to the bookstore but felt queasy on the way to the cash register. With so many unread books about education sitting on my desk I could not bring myself to give any more of my money to these business authors. Eventually I purchased and read Daniel Pink’s book, A Whole New Mind: Why Right-Brainers Will Rule the Future. I did so in order to be able to discuss the book thoughtfully on various blogs and in professional development settings. What business gurus like Don Tapscott, Daniel Pink, Malcolm Gladwell, Stephen Covey, Tony Robbins have in common is that none of them actually ever ran a business prior to hitting the bestseller list offering business advice to others. Most of them have never been the night manager of a Seven-Eleven let alone launched or managed an innovative business venture. That is their skill. Several are evangelicals. Faith or pseudoscience, along with a dose of prosperity theology, is used to advance their arguments. Their audience is adults who dream of being rich or increase their personal productivity. Neither goal is analogous to the education of children. I’ve observed that the fancy talkers tend to have three or four good stories, perhaps as many as seven, they use to captivate their readers. If you see the author on Charlie Rose, you hear the three stories. Google an interview and you’ll read the three stories. Read the book and the three stories will appear verbatim. There is a polish to their schtick that often masquerades a lack of depth or thoughtfulness. Many of these authors are linguistic jugglers. They can turn a phrase (or at least a handful of rehearsed ones) brilliantly. I compared Thomas Friedman to Nipsey Russell in my review of Friedman’s book due to his penchant for reducing complex ideas to puns. Ultimately the success of these books is based on the authors’ ability to reduce complex concepts to simplistic binary dichotomies or playground rhymes. Such books are filled with numbered rule-based advice with little room for nuance. Issues are either black or white. The principles apply to any situation. Obviously, lots of people buy these books. Some even read them. Many of the readers are hooked on this genre of business book and purchase lots of them. Ironically, the people who don’t read these books are successful business leaders. The New York Times article, C.E.O. Libraries Reveal Keys to Success, tells us that most successful business leaders, the people self-help book readers wish to emulate, do not read business books. They read poetry and novels and great non-fiction written by experts. In short, CEO libraries are tributes to a great liberal arts education. Now that is a lesson school leaders should learn. It is the great insecurity of wannabes that drives the sales of popular business books. I am of the opinion that educators with limited time should not squander it studying to be CEOs. This is especially true when these books are written by charlatans and touted by educational gurus who themselves are fancy talkers. Education should be about doing, not talking. Education leaders should be well versed in the literature (past and present) of their chosen profession. Alan November, Will Richardson and other well-respected educators are fans of Daniel Pink’s 2005 book. I had not read the book until recently. Recently, David Warlick wrote in his blog about how excited he was to be speaking at the same event for school leaders as Daniel Pink. Warlick is obviously a fan of Mr. Pink’s work. Surely, an “expert” earning large sums of money for the privilege of speaking with large groups of educators about learning and leadership should know something about learning and leadership, right? So, I broke down and bought A Whole New Mind. What follows is my initial review. I intend to elaborate on this analysis as time permits. Pink’s entire thesis falls apart in the book’s opening paragraph. "The last few decades have belonged to a certain kind of person with a certain kind of mind – computer programmers who could crank code, lawyers who could craft contracts, MBAs who could crunch numbers. But the keys to the kingdom are changing hands. The future belongs to a very different kind of person with a very different kind of mind – creators and empathizers, pattern recognizers, and meaning makers. These people – artists, inventors, designers, storytellers, caregivers, consolers, big picture thinkers will now reap society’s richest rewards and share its greatest joys." This argument reeks of the cheapest form of populism – playing on the economic insecurities of Americans to reiterate the horrific prospect of Indian and Chinese children destroying our precious way of life. OK, lots of fancy talkers make this case (re: Tom Friedman). Pink’s basic thesis is much more objectionable, he uses pseudo-science unconvincingly to advance what is otherwise another pop business book. The first paragraph of A Whole New Mind is a hideous slur against every man and woman working as what new-school Pink defines as old-school knowledge workers. It is simply not true that the kind of people he dismisses (programmers, lawyers or MBAs) either have a different kind or mind or lack any of the more desirable traits he blesses in the next sentence. These are the words of a man who never used "that" kind of mind, because if he had he would understand that scary smart people are also creative and compassionate. Programmers are not pattern recognizers or creators? Give me a break! Ways of knowing are not mutually exclusive. One gets the sense that Pink doesn’t even really believe the right-brain/left-brain ideology he advances in the book. However, real scientists who actually study the mind dismiss such simplistic models. Marvin Minsky of MIT, and author of The Society of Mind, calls the right/left brain stuff the “dumbbell theory.” Mind and brain researchers possess a humility that allows them to acknowledge the great mysteries associated with science. Daniel Pink leads readers to believe that he has a handle on how the mind actually functions. The need for brain-based justifications for treating humans individually and with respect demonstrates the weaknesses in thinking Pink seeks to overcome. A reliance on junk science and mechanistic explanations of unexplainable mental phenomena does little to advance the quite simple proposition that all sorts of talents and aptitudes should be celebrated. By the way, if you embrace Pink’s two categories of minds/thinkers/workers, where would you place teachers? I know. We’ll place ourselves in the good pile of people. Pink can’t keep the differences between mind and brain straight, but admits that the whole discussion is only a metaphor anyway. His ignorance of the "old kind of mind" is unrivaled by his ignorance of the "new kind of mind." Once again, terms like symphony are used as metaphors without the slightest regard for what a symphony is or how it’s created. The fact is that there are numerous similarities between writing a symphony and programming a computer. But that’s in the real world, not the "new" world Mr. Pink predicts based on his experience as a Gore speechwriter, law-school grad who never practiced and latrine digger in Botswana. At the end of the day there is nothing revolutionary or even new about what Pink presents as “new.” The book not only plays loose and fast with facts, but the traits ascribed to the evolved human workers of the future can be found in any good salesman of the past century. Many of my colleagues in the blogosphere and on the speaking circuit mean well. They honestly want schools to offer what Sarason calls, more “productive contexts for learning.” However, their embrace of pop business gurus and their methods do little to advance this noble agenda. Learning is personal, diverse and complex. Reducing learning to a handful of teaching tricks does nothing to advance education or improve schools. A Whole New Mind cannot be reconciled with my own scholarship and twenty-five years worth of thinking about learning. My personal experience obliterates the firewall Pink builds between the two hemispheres of the brain. Several bloggers conflate Pink’s advocacy for increased arts education with his frivolous claims about the mind and economic success. Grand proclamations about the future are offered as substitutes for doing the hard work required today. Neither mind nor future economic prosperity are sufficient arguments for arts education. Students should enjoy rich, diverse and bountiful arts experiences because it is what makes us human. However, too many of the Web 2.0/School 2.0 community have given up on the promise of school. Media mashups and video games are discussed as substitutes for the discipline and powerful ideas required to play an instrument, write a novel, build a mathematical model, design a computer application, construct a robot or make sense of a rapidly changing world. Music education enriched my life in innumerable ways. Studying music (up to three periods per day) with professional musicians (expert mentors) in the Wayne, NJ public schools laid the foundation for both my Ph.D. in Science and Math Education and being the new media producer for a Grammy Award-winning project this year. Learning to program computers in the 7th grade, where it was required of every student as a rich intellectual pursuit, helped me develop the habits of mind that serve me everyday. The seeds of my social activism and vocation were planted when at the age of 18 I saved school music from the budget ax. Devaluing the arts is not new or the exclusive fault of NCLB. The nation began losing its soul and sense or priorities decades ago. Pink offers scant advice for reversing this trend. Although school was often a mind-numbing, soul-killing experience I learned to play an instrument, love the arts, program computers and compose music in the public schools. I wish that every child may enjoy a plethora of rich learning adventures. Jingoism and junk science offer insufficient justification or motivation for educational progress. Wesley Fryer’s recent blog, A digital playground of dreams?, makes the case for play and then discusses what would/should be in a digital playground. I think the logic is that if real playgrounds are good for kids, so are digital playgrounds. OK, so far so good. But then the article assumes that software (at least software for kids) should be free. Why is free the criteria? Why is software so devalued that a growing number of people believe it should be free? Balls and playground equipment are not free. Hardware is not free. Spelling books and standardized tests are not free. Why not have free teachers? You could all work voluntarily. Is the quest for free software rooted in the low self-image of educators? Why should teachers depend on charity? This emphasis on “free-ness” seems sad, needy and symptomatic of powerlessness to me. It’s one thing to be a good bargain hunter on behalf of your students. I too have learned to wait around conference exhibits waiting for vendors to give me books and PE equipment they don’t want to ship back to the office. However, that seems qualitatively different from the lonely teacher I see shuffling out of the half demolished exhibit hall carrying armloads of free bags full of other bags. Should educators be reduced to bag ladies? Is software the new free ballpoint pen? In all, but the last (and least common) case, the free software you are using cost you as a taxpayer or someone else, as a stockholder. You just didn’t use a credit card at Best Buy to pay for it. It is certainly the case that educators embraced Microsoft Office as what kids should do with computers. I’ve been on-the-record against children playing Donald Trump dress-up in computer labs for decades. For Pete’s sake you can satisfy ALL of the ISTE standards with Office alone. The new appeals for creativity and innovation are mere lip service. Even with productivity tools (what an awful term for children) you could do with fewer features. Such streamlined design would reduce costs and make software more usable and developmentally appropriate for children. This does not mean for one instant that I believe that preschoolers are incapable of using Office. What I do mean is that the false complexity implied by too many menus, submenus and dialog boxes ensures that the teacher’s focus is on features and the software’s peculiarities rather than on its creative use. Don’t believe me? Look at the number of district tech plans that make using scroll bars a nine-year scope and sequence? How many 700-page books are published to teach you to use a web browser or word processor? I love inexpensive software, but I’m weary of digital handouts. Some of the most ingenious pieces of software I use regularly are shareware. I pay a reasonable fee to a clever person who provided me with a great service. The fact that districts, states and national governments surrender too much public treasure to Microsoft is not an argument against hardworking software designers and programmers earning a living. Some countries (more so than in the USA) often subsidize the development of software and materials for schools that compete directly with the open market. You’d be hard pressed to identify three such products that were worth what the government invested. Sure, it’s relatively easy for programmers to knock-off free copies of existing software – paint programs, word processors and even operating systems fall into this category. Occasionally some of these programs are even better than the commercial originals. However, the hard expensive work of invention has already occurred. It’s expensive and incredibly hard to invent (after all software design is a form of invention) productive contexts for learning; what Seymour Papert called microworlds. Microworlds facilitate creativity, problem solving, divergent thinking, debugging and encounters with powerful ideas. It takes educational experts and gifted software designers to create such environments for children. If such software packages are developed, their sales potential is extremely limited since their market is almost exclusively K-12 schools. The same customers that expect software to be free. Have you noticed that the educational software industry is nearly dead? This is one reason why I organized The Constructivist Consortium. The Consortium brings together publishers of creative open-ended learning materials so they may stand out in a sea of “smart” furniture, multiple-choice clickers and testing software while giving voice to the fantastic educators who work every day to provide constructive creative learning opportunities for their students. Even in the hey-day of Reader Rabbit and Math Blaster, the school market was just viewed as a way of lending legitimacy to dubious software packages for sale at the local Wal-Mart. Schools never bought much of the software, but the publishers were able to point to classroom use as a way of convincing parents that the software would “teach” their children something. Small creative educational software companies, such as Logo Computer Systems, Inc., (LCSI) now in its 26th year of creating powerful software environments for learning, have worked tirelessly to make high-quality products available to American students, but they are no match for the white board pitch-men and the integrated “learning” systems companies. Many of you may not remember this, but it was LCSI, a 100% educational software company, that invented the site license with the release of LogoWriter in 1985. Such brilliant software grew with the learner and could be used creatively for years cost very little. However, its developers deserved to feed their families and invest in the development of future software like LEGO TC Logo and MicroWorlds EX. It was also LogoWriter and later, MicroWorlds, that fueled the education renaissance in Costa Rica. (see articles here and here) Teachers began to see themselves and their students’ potentials through fresh eyes and not only were Costa Rican schools improved, but the nation’s economic fortunes rose as well. As the person who led professional development in the world’s first laptop schools back in 1990, I have spent nearly two decades as an unabashed evangelist for every student owning a personal portable full-function computer. I am an unapologetic supporter of the $100 Laptop initiative and refuse to be drawn into petty squabbles over hardware features, price-point or whether or not the project honors teachers sufficiently. I believe that putting millions of PCs in the hands of children does hold the potential to change the world and may offer the first opportunity in generations to rethink teaching and learning. That said, my greatest disappointment with the One Laptop Per Child project is that the principles involved do not think that it is difficult to develop high-quality intellectually expansive software for children and they refuse to pay others to develop it. Without such software, the potential of the $100 laptop will be severely crippled. Children will be able to consume information and chat, just like American kids. They just won’t be able to create or be the mathematicians, scientists, composers, engineers, filmmakers or computer scientists they could be if the “smart” adults behind the development of the hardware had more respect for software development. A great robust developmentally appropriate programming environment, like MicroWorlds EX, would be a welcome addition to each $100 laptop. However, Redhat employees cannot develop such software during their lunch break. It requires expertise and insight into learning that they (and even MIT students) lack. It’s too bad since such an environment would add sustainability to the creative and intellectual use of the device and allow students to create software themselves. I fear that if fewer children have experience programming computers and expressing themselves symbolically, then software will cases to have any value at all. Wes Fryer’s blog paraphrases Alan Kay about “inventing the future,” but the actual quote is “The best way to predict the future is by inventing it.” I’m confident that Dr. Kay believes that one way of inventing the future is by constructing knowledge and new tools via computer programming. The future does not look very bright if as Seymour Papert pointed out, we deprive children of the opportunity to understand and control the technology so central to their lives. Why not call software an invention? People don’t expect inventions to be free? 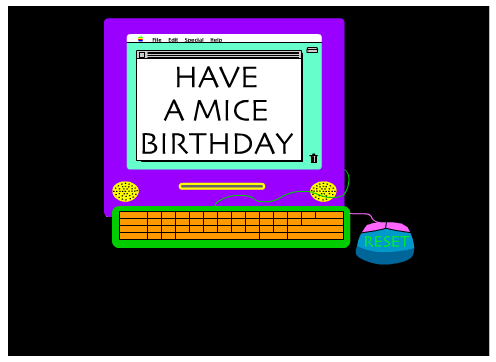 I love love love my two nephews, ages 8 and 10, but they just sent me a birthday eCard – yuck! Type in an email address and voila! Your loved one has to watch a crappy animation that takes too long and conveys no real emotion. Skip the 600 Words. Write the Review First! My articles in District Administration Magazine and The Pulse: Education’s Place for Debate often elicit strong letters from readers, but today’s mailbag reached a new low. Someone read an online synopsis of a recent article and sent me a screed full of personal attacks. The email and my response follows. Enjoy! I see that you have nothing better to do. Jealousy! What can you do about it? There are more important issues than Oprah and her money. What’s your contribution to how we tackle illiteracy? What else have you written? What research have you conducted? As the old saying goes, You’re a part of the problem. Where is the solution? Abstract: The article discusses the author’s perspective on the establishment of the school Oprah Winfrey Leadership Academy for Girls in South Africa. He cites that the $40 million school established by TV host Winfrey has been subjected of controversy which some people are offended that it features fine china and trillion thread count sheets. He admits that he already read and watched about the school but still asks the educational philosophy of the school and the learning theories that excite Winfrey. The link information above provides a persistent link to the article you’ve requested. Persistent link to this record: Following the link above will bring you to the start of the article or citation. Cut and Paste: To place article links in an external web document, simply copy and paste the HTML above, starting with "<A HREF"
If you have any problems or questions, contact Technical Support at http://support.epnet.com/contact/askus.php or call 800-758-5995. This e-mail was generated by a user of EBSCOhost who gained access via the WALDEN UNIV account. Neither EBSCO nor WALDEN UNIV is responsible for the content of this e-mail. Thank you for your email. You may read my dozens of publications at http://www.stager.org/articles and my qualifications at http://www.stager.org/bio While there. You can actually read the article that seems to have offended you. I just returned home from one of the major book superstores near my home. 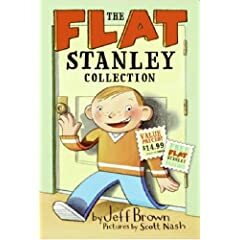 While waiting to pay for a boxed-set of Flat Stanley books for a five year-old coming to visit, I overheard the following conversation between the bookstore cashier and a nervous acquaintance of his. Customer: Did you get the email I sent? Customer: I did a speech on evolution. Cashier: Not for it I hope? Cashier: I thought you stopped going. Cashier: Do you ever read anything from the other side just to see what they think? Now, I’m all for religious tolerance and the free exchange of ideas, but by people who can support their arguments with evidence. After all, I’d hate to live in a country where scientific decisions were being made by lethargic part-time community college students. The shy creationist exits the store and I wonder if I should say something to the cashier. I approach the cashier and say, “You really ought to read Hitchens. He’s one of the smartest guys around. You don’t have to agree with him on every issue. In fact, I think his support for the War in Iraq is dead wrong.” The cashier admitted having seen Hitchens on Hardball. Perhaps he’ll actually consider the perspectives of people who don’t agree with him. That’s the kind of citizen, neighbor and bookstore employee we need. 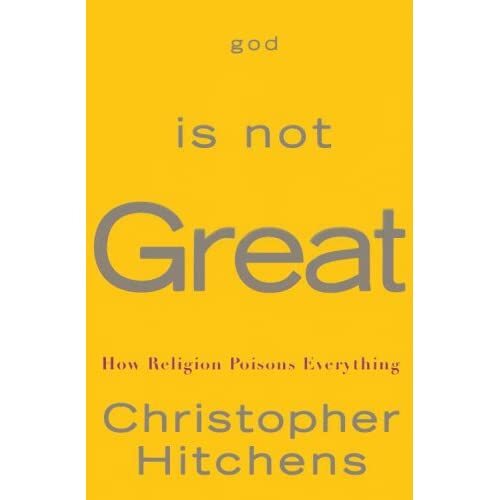 Note: The full title of Christopher Hitchens’ best-selling book is, God Is Not Great: How Religion Poisons Everything. The complete title is required if one is to begin to understand the author’s thesis. Click either book cover for more information or to purchase. David Warlick wrote a blog this past weekend, Games • Learning • Society [classroom strategy guides? ], in which he discussed gaming, the use of cheat sites by gamers (kids) and the obvious question of whether this phenomena has any implications for school. “It occurred to me that study guides for tests are a lot like strategy guides for video games,” wrote Mr. Warlick. Studying, which in school parlance really means memorizing, is based on the assumption that learning is unnatural. This is categorically untrue. “Learning” a computer game cheat code from a web site is a very low-level of learning. It’s just looking something up, like much of what schools misrepresent as student research. This activity bares little resemblance to “studying” the violin or “studying” to be a brain surgeon. Some educators marvel or recoil at students finding cheat codes on the web, but that’s only because ingenuity is so rare within the school curriculum. Classroom mischief may offer the richest or exclusive contexts for ingenuity. If school wasn’t based on right and wrong answers, studying would be unnecessary. Cheating is only necessary when it’s viable. Assessment schemes, like tests, are only necessary when teachers are not respected and when teachers don’t trust their own instincts. Smith Magazine (whatever the hell that is) has a really interesting story about Richard Farmbrough of Stamford, England. The Wizard of Wiki is an interview with the man with the largest number of entries in the history of Wikipedia. You know what? The more I look around Smith Magazine, the more I actually dig it. I may bookmark the site or add it to my RSS feed. Smith Magazine reminds me that the dream of my own magazine, Stager, may be within reach. It’s always kinda weird and creepy when adults, particularly academics, talk about computer games. It’s a bit like your grandparents saying, “groovy.” That said, your roving reporter David Warlick reports on a presentation by Dr. Angela McFarlane in which she shares some impressive data about teacher attitudes towards the use of computer games in U.K. classrooms. Unfortunately, I was unable to hear Dr. McFarlane speak this week, but I suspect that what she means by computer games, may differ substantially from what we Americans mean. You might wish to investigate what the UK considers computer games. As it’s been said, the UK and Australia have long used games in their teaching even if those games (and their formats) would be completely alien to Americans. I don’t suspect that “off the shelf” means Grand Theft Auto or even Math Blaster. Another old colleague of mine, Mike Matson, had a company, 4Mation, in the U.K. that created graphic adventure games for children. (read about him and his work here. Two of his most famous titles were Granny’s Garden and Flowers of Crystal. We’ve had graphic adventures in the United States, but they never took off in classrooms. On the otherhand, Matson’s masterpieces sold LIKE CRAZY and were used widely in Commonwealth Countries. I hardly ever visited an Australian or New Zealand school without seeing or hearing about one of Mike’s adventure games being used. They weren’t simulations as much as they were digital literature. 1) Kids didn’t just play these graphic adventures on the one computer in the back of the classroom. Teachers used them as a catalyst for storytelling, map building and countless interdisciplinary projects. These games were the basis for long complex thematic units. Walls were covered with art and student writing related to the “game.” Classrooms became fantasy lands where students could imagine being inside the world of the computer games. I fear that few American educators would find the educational benefit in such fantastical sustained classroom excursions. I could imagine such activities being dismissed as fanciful or frivolous. 2) American software publishers could not and would not understand the success of 4Mation’s products. My colleague Sylvia Martinez can tell you about the stunned looks of disbelief on the faces of her colleagues at America’s most popular educational software company (mid-90s) when she brought Mike Matson in to discuss the possibility of working together. However kids and enlightened imaginative teachers (unmolested by NCLB) recognized the magic. 4Mation is still in business. I believe that Matson has moved on, but the company’s web site features drill and practice titles. Perhaps that’s the American influence on Britain. MicroWorlds EX, my favorite software environment in which kids can make their own games and learn what the adult software developers have been keeping for themselves. Sylvia Martinez has forgotten more about game design, gaming and the commercial tensions involved in game development than most people will ever know. Sylvia holds a Masters degree in educational technology, was an aerospace engineer, Executive Producer at Davidson and Associates and Knowledge Adventure, created Math.com and was VP of a game development company that created platform games for the Gameboy, Playstation and Xbox. Sylvia has written some terrific articles about why its not that simple to place your faith in educational games as a vehicle for educational progress.